On a second trip to Mamak the roti tisu was the first thing that had to be ordered. The majestic appearance of this golden brown roti, shaped into a witches hat, had caused us all to swivel heads as it sailed past our table and over to the other side of the room. Today it's our table that receives looks of envy as neighbours poke one another in the ribs and point towards it. It is with more than a little self-satisfaction that I break off a shard. 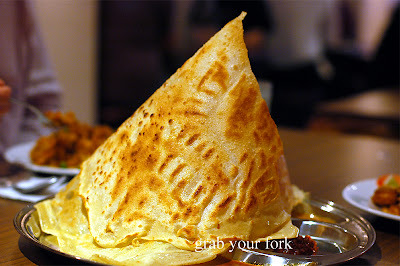 The roti tisu, explains the friendly roti flipper out the front, is stretched out into a paper-thin rectangle and grilled until crispy. It's brushed with butter, sprinkled with sugar, then allowed to caramelise; three swift diagonal cuts follow and it is quickly folded into its final conical appearance. The roti is crisp but markedly sweet. Nevermind that it is listed under the Sweet Roti setion and recommended with ice cream. 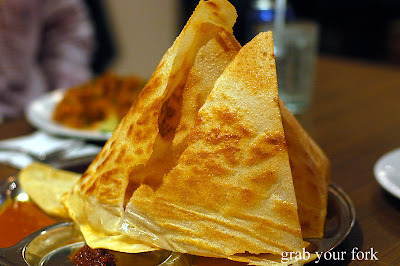 It's also available with two curry dips and sambal and a quick glance around the room shows we're not the only ones sporting a sweet roti peak. 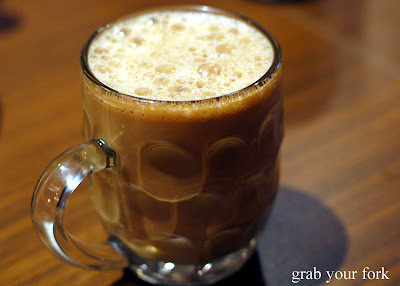 A beer mug of teh tarik is the favoured drink here. Warm and slightly sweet, the milky tea has a foamy head of froth, traditonally created by pouring the drink at great heights from one cup to another. 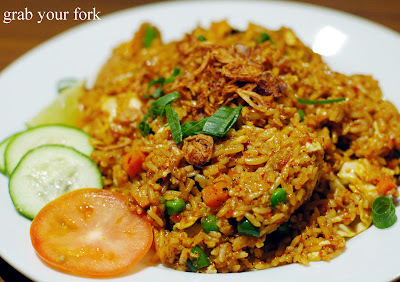 Nasi goreng is a colourful mound of golden fried rice, Malaysian-style. Kecap manis, a thick sweet soy, gives the rice a sweet brown tan. There's a background hum of chilli, a handful of fried shallots providing crunch, and a few slices of cucumber and tomato to refresh the palate. 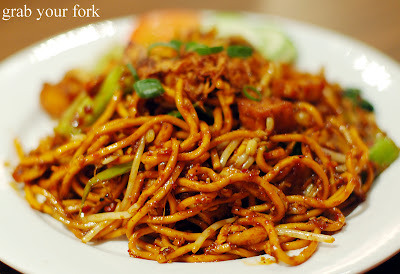 Mee goreng also has a chilli kick. Thick chewy strands of hokkien noodles cavort with a smattering of prawns, cubes of deep-fried tofu, wilted bean sprouts and splashes of green onion. 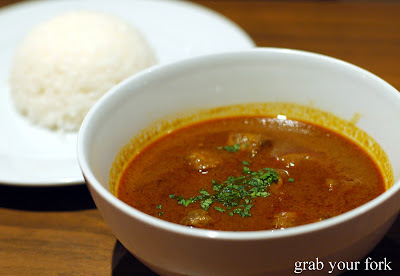 The kari kambing lamb curry is reasonably tender, the thick sweet gravy perfect for ladling over steamed white rice. I'd chosen the nasi lemak, the Malaysian version of a ploughman's lunch. A compacted mound of steamed coconut rice sits with a smudge of sambal and a halved boiled egg. Diced cucumbers give sweetness, fried peanuts and anchovies provide the crunch. My fried chicken leg is straight from the fryer, a golden batter encasing flesh that is moist and juicy. It's a little bit of everything and we eat everything up. 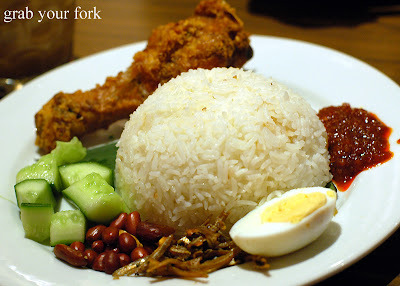 The nasi lemak plate looks very much like a lunch you'd find in a cozy diner. What a delicious meal...and I love the witch hat! For the nasi lemak, are the cucumbers pickled? i'm used to achar with a bit more variety then that...the nasi lemak at Baba's @ Grace Hotel is pretty good, but their dishes are much more expensive. otherwise, everything looks great, would love to go for a visit! Hi Sherry - Nasi lemak is always comforting, and the witches hat, I mean party hat (hehe), was fun. Hi Case_In_Point - No the cucumbers weren't pickled. I've never seen achar arrive with nasi lemak in Sydney. I'll have to check out Baba's sometime. 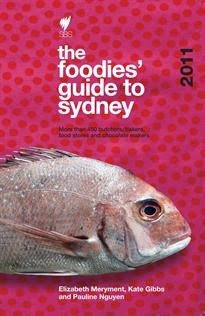 must stick it on the (ever growing) list of things i have to eat when i get back there!! my mum serves achar with nasi lemak when she makes it at home. it might just be because she likes it that way though. Hi Bec - I could see how achar would really work with nasi lemak. Pickles always taste good with fried food, I think :) I would love to go to Malaysia. 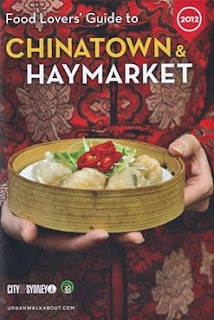 The thought of all that wonderful street food is enough to make me cry with hunger! 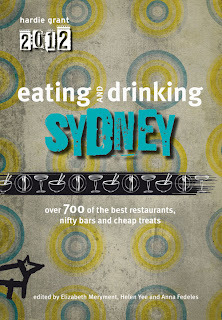 ooh what a coincidence - Simon Thomsen's got a review of Mamak in the SMH today. I went here the other night as I was staying just round the corner. The roti was great (I had the red onions), so was the satay (nice and smoky). No rojak when I went unfortunately as I was really looking forward to it. Definitely on the list for next time. 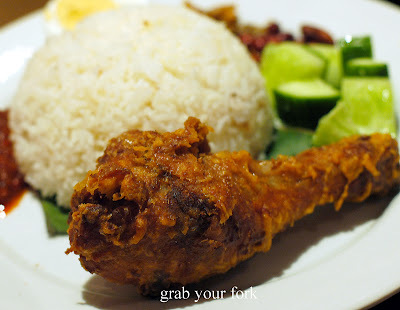 I tried nasi lemak there and it was sooo delicious. Even better than Kopitiam version because they give you fried chicken (my favourite) which is best eaten with nasi lemak, not curry chicken. The chicken satay is also very good and the sauce is so tasty. Not like your usual peanut sauce, this one is a mix of sweet, sour and mild flavour. The other good Malaysian place is Sam Satay in Surry Hills. You should try that place in your next foodie visit, Helen. there's a new singapore/malaysian restaurant in pyrmont, 50 Harris st. it's called drunken geisha...so un-singapore/malaysian. anyway, their beef rendang is good. they even have chicken rice, though only on saturdays. Hi hj - Drunken geisha? What a crazy name! Will have to check it sometime :) Thanks for the tip! tried mamak.It was okay. Now drunken geisha (cute name) in prymont is a must try for sin/m'sian food!! 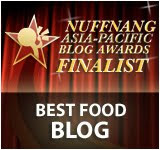 loved the beef rendang and curry!! yummy! Their stir fried dishes are amazing too. glad i tried this restaurant out after reading their highly recommended reviews on eatability. 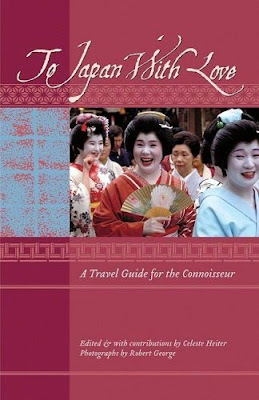 Hi Anon - I have read a few reviews of Drunken Geisha. Thanks for passing on your feedback!